Is it because, like the disciples, we see the challenges God may have for us through the lens of fear? In ancient times, water was a symbol for chaos, evil, and dark spirits. It was God who controlled this chaos. In creating the world, God separated the waters to form the world. God let chaos roam as waters flooded the earth when God started over with Noah and his family. God separated the waters of the Red Sea, giving the Israelites safe passage out of Egyptian slavery. Because of this ancient and Hebraic view of water, the disciples saw their situation through this lens of fear – the water was a dangerous, uncontrolled place. That might help us understand when a figure emerged in the distance, their first thought wasn’t that it was Jesus, whom they knew was on that side of the sea and could do the miraculous, rather they thought, it’s probably a ghost.” How often do we get a distorted view of things because of our fears? Fears seem to enter our lives through lies. When I was a young child, like many young children, night time alone in my room was a place of fear for me. My mother, probably tired of coming in my room at night, had a unique solution. She made something she called “Monster Spray.” She put it in this little spray can [hold up bottle]. It has directions on it [read instructions]. She’d spray it in my room at night after I was tucked in – it was a sort of technique my mom used to manage my fear. Yet, it didn’t show me things as they are – it kept the lie alive, just changed it a bit. Monsters weren’t about to get me – they do exist, they’re just keeping their distance to avoid that pesky monster spray. My mom was able to keep this fear of mine in check, but fears often have a way of getting out of control, of exaggerating, of paralyzing us. When you think about it, Jesus wasn’t asking Peter to do anything really risky. He wasn’t asking him to step off a cliff like Wily E. Coyote. It was just water. It wasn’t even eel infested water. The worst that could happen is that he would get wet. And Peter was a good swimmer. This is true – in his commentary on this passage, John Wesley actually says that Peter was a “skillful swimmer.” He was sort of the Michael Phelps of the disciples. The gospel of John records him jumping into the water voluntarily on another occasion. You see, that’s what fear does – it exaggerates itself and we cower in front of it. And it keeps us from walking towards Jesus. In the midst of their fear, Jesus came out onto the waters and said to the disciples, “Take heart, it is I; do not be afraid.” Now, to me, this doesn’t seem to sound like the sort of thing that a ghost would say, but Peter doesn’t seem convinced yet. In what I think may be the most moronic line in all of Scripture, Peter says to Jesus, “Lord, if it is you, command me to come to you on the water.” Now, think about it from Peter’s perspective, this is a lose, lose situation. If it is a ghost, he’s toast. If it is Jesus, he’s going swimming in the middle of the night in chaotic waters, probably without a change of clothes – I don’t know, the text doesn’t say. Imagine what it was like on that boat, the disciples were out there thinking a ghost was coming towards them – what should they do? Should they speak to it? No, maybe that would make it mad. I can hear Andrew saying to John, “you say something” and John back to Andrew, “no, you say something.” It was a moment of hesitation on that boat. Each wanted the other to take the first risk. For the disciples, the fears that they were living with in that moment was preferable to taking a risk and engaging the ghost. And as often happens when no one’s quite sure what to do and everyone’s anxious, some moron foolish enough to be bold steps up and blurts out something that upon retrospect could have been thought through a little more. It is a tension we see in this story – fear hesitates, trust acts immediately. Peter wrestles with both, hesitating, then acting; trusting, then sinking back into fear. Three times in this passage, Jesus acts immediately – immediately he makes the disciples get on a boat, immediately he calms the disciple’s fears and immediately he rescues Peter when he hesitates in the water. Now Paul tells us that patience is a fruit of the Spirit, but I think often we confuse patience with hesitation. Both are states of waiting, but one is full of trust, while the other is full of fear. And Jesus waits in this story. He made the disciples get into the boat and dismissed the crowds and gave himself time alone to pray. It was evening time when Jesus went up to the mountain to have an encounter with God and it wasn’t until the early hours of the morning when Jesus came out to the disciples – this was waiting done full of trust – patience. Some commentators have suggested that this whole event was contrived by Jesus as a spiritual exercise for the disciples. You see, earlier in the gospel of Matthew, the disciples found themselves in a boat on the waters in the midst of a storm. But that time, Jesus was with them on the boat. This time, Jesus was far away, perhaps preparing them for a time when he wouldn’t physically be there at all, getting them to trust in his spiritual presence. Patience is trust filled waiting. Hesitation is fear filled waiting. Rather than acting with trust, in the midst of our fears and hesitation – when we get that sinking feeling that Peter experienced literally, we hesitate. We like to develop techniques, like Monster Spray to manage our fears. You know you can actually walk on water, if you have a certain technique. Why then this talk about risk and trust, when we can actually follow some techniques developed to walk on water. 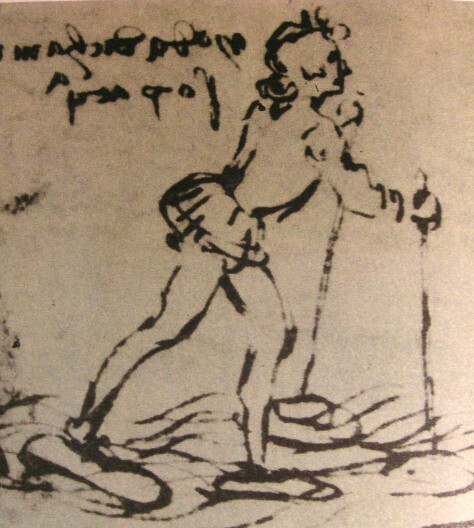 Leonardo Da Vinci actually designed a machine that would allow humans to walk on water. Here’s a picture of it. I bet we’ve got an engineer or two in here who could put something like this together, maybe then, we can eliminate our risk. Here’s another idea – a few years ago at a Vacation Bible School I worked at where the children studied this passage, they did an activity where the children would walk on water. Only, they combined the water with massive amounts of corn starch and blue food coloring, giving the water a viscosity more like play-dough. I know, it isn’t exactly the same thing as walking on water, but it sort of, kind of gets us there. We could at least say we walked on water. 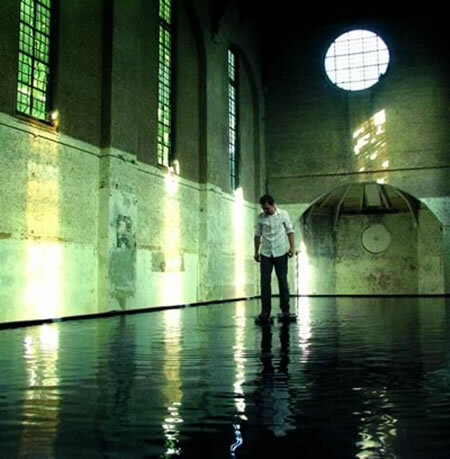 Or we could do like a church in London did where an artist developed a machine that had moveable mechanical platforms for your feet that were submerged just below a pool of water, allowing you to walk on water. Perhaps the Trustees could get one of these installed in the ministry center. 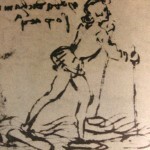 A professor at Florida State University, Dr. Doron Nof has suggested that walking on water wasn’t about a technique or about trust, but rather trickery. No, he didn’t claim that Jesus didn’t walk on water, like most skeptics, but he did develop a theory that a rare combination of optimal water and atmospheric conditions could result in localized freezing of water that from a distance would be undistinguishable from unfrozen water. Perhaps Jesus was stepping on these little ice patches. But my favorite technique is actually a little closer to the real thing. Some athletic European men have developed a new sport that they are calling “liquid mountaineering,” where they actually walk on water. This technique relies on water repellant shoes and other equipment, a particular way of moving your feet, and a positive belief mindset. Let’s take a look. 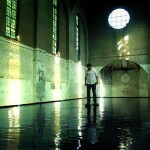 So, you see, there are lots of ways that we can walk on water – so why trust? That takes risk and could involve failure. Author, Seth Godin, describes a phenomenon called “the dip,” where he says that after a new challenge is taken on, there comes a time when the smooth sailing stops, a sophomore slump, a point when things start to get difficult. This dip, separates the excellent from the masses. How do we get to the other side of that dip – Peter didn’t make it. Even with cutting edge techniques, the liquid mountaineers still fell into the dip. It isn’t a technique we need, but trust. Trust is what actually reveals that there are no monsters after all and no need for Monster Spray. In fact, liquid mountaineering turns out to be an internet hoax. If you were fooled, you weren’t the only one. I didn’t realize it at first, until researching it further for my sermon. A local television station actually reported it as news as well. And we too often fall into the seduction of valuing techniques more than trust. Jesus came out onto the water when the disciples were being tossed around on the sea. He immediately reached his hand out to save Peter when he began to sink. This story tells us that God both comforts and challenges. But what is the relationship between the two? For what purpose does Jesus comfort the disciples? What if God’s comfort is the safety net for the challenges God gives us? That’s the way it seems to function in this story – Jesus comforts the disciples and then bids Peter to come to him on the water. Jesus saves Peter and then disciples proclaim “truly you are the Son of God.” That phrase wasn’t merely a statement of worship – but a dangerous acknowledgement of an alternate political reality – the kingdom of God. You see, Roman Emperors at this time also had the title, “Son of God.” And this was a revolutionary time when Palestine was occupied by Rome. They had begun to embrace the challenge. Many of the church fathers interpreted this story allegorically. They saw the boat as the church and the waters as this world. And I couldn’t help but think of our church, Grace as the boat. It is probably too strong to say that we’re in the midst of dark, chaotic, ghost filled waters – but we do find ourselves in a time of transition. We’ve experienced pastoral transition, building transition, and no doubt other changes lay ahead. We’ve decided as a church to go through a program called Natural Church Development, which will help identify our strengths and areas for growth. Our District Superintendent has identified us as a church to receive special training from a consultant designed to help us better understand who we are, engage our culture, and grow. It seems as if we’re entering into a time of introspection and rediscovery of who we are – what our identity is as a church. In the next three weeks, Pastor Bryan will be leading us in a sermon series based around our church’s mission, “Praising God, Proclaiming Christ, and Serving Others.” During this time of discovery, I have a hunch, that we may find out that we have some weaknesses or challenges to face as a church. We may be forced to ask what our fears are as a congregation. We may feel that we’re not equipped to embrace the challenges God has for us. We may find that as one pastor said “the reason we seem to lack faith…is that we are not doing anything that requires it.” We may remember that God calls fearful, sleep deprived morons as partners. I hope that the moment when we come face to face with a challenge, that our congregation would remember that we worship a God who said, “Take heart, it is I, do not be afraid.” Perhaps at that moment, we’ll find ourselves walking on water. Lord we confess that too often we are like the disciples, praying in the middle of the storm, when you prayed before it. We tend not to trust you until we come to our own limits. Form us into the kind of people who have faith that you are always and immediately present in the midst of our fears, our failings, and underneath whatever challenges we can muster up the faith to take on. Amen.